With older tongue-and-groove hardwood or even wide plank floors, gaps inevitably develop between the boards. The problems with this are numerous. First, it is unsightly and it makes it difficult to clean because these gaps become dirt magnets. Not only that, they can become a trip hazard if the boards begin to cup or curl, a common occurrence with old wood flooring. When the floorboards have been installed directly on joists, gaps can even cause your room to feel drafty. While this is normal airflow coming up from your basement or crawlspace, it causes your heating system to work harder to pump out more heat, costing you more money. 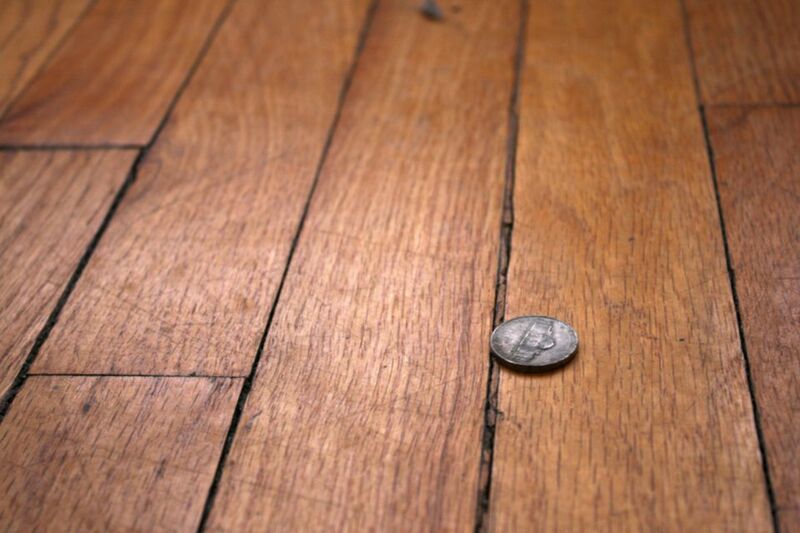 If you can fit a nickel on-end into any of your gapped floorboards, you may have a developing problem. Gapping is a common problem with older wood flooring as the wood shrinks over time. The problem is magnified when the boards were not tightly laid in the first place. Another exacerbating condition is water damage. Water-logged wood will first swell then shrink as it dries out. Floors that have excessive heat below, as in the case of a furnace room, are particularly prone to developing gaps because of the dry heat they are subjected to. Should You Fill Your Gaps? It's important to keep in mind that all wood expands and contracts with seasonal humidity changes. If you're bothered by gaps in the dry winter months but don't seem to notice them much during the relatively humid seasons, it's probably best to leave the gaps alone, as filling them when they're at their widest will create problems when the wood expands again and the gaps close up. In extreme cases, floorboards can buckle if you leave no room for them to expand. On the other hand, old flooring can develop gaps that are more or less permanent, although they still may get slightly wider and narrower with humidity changes. If you're certain the gaps are there year-round, it's probably safe to fill them. However, it's best to do this during the humid season, when the gaps are most narrow. That way, you can't fill them too much and leave them with no expansion space. Of course, this means you might see slight gaps when the wood shrinks again next winter. Alas, wood is what it is, and you can't change nature. This method involves using a table saw to rip strips out of spare floorboards you might luckily have laying around. If no matching floorboards are available, you can use new or salvaged boards of the same species. Measure the width and length of each gap. Set up a table saw to rip-cut strips to the measured width. Note: Ripping thin strips of wood on a table saw can be hazardous and requires specific safety precautions. Get expert help if you need it. Cut the strips as needed for the length of the gap to fill. Apply wood glue to the sides of each strip and gently tap it into the gap, using a mallet or hammer. Try to get the strip flush to the surrounding wood. Let the glue dry. Plane or sand down any high spots in the strip(s), being careful not to damage the surrounding finish or boards. Stain and/or finish the strips to match the rest of the floor. Filling large gaps with natural-fiber rope is a traditional method commonly used on wide plank floorboards in very old homes. While the rope doesn't look like wood, you can stain it to blend with the floorboards, and the filled gaps are much less noticeable than the dark, empty gaps. Be sure to use natural rope, such as jute or cotton, because synthetic rope won't accept a stain. Scrape out the gaps with a screwdriver, painter's 5-in-1 tool, or a similar tool to remove all dirt, gunk, and old putty from the gaps. Be careful not to damage the edges of the floorboards. Vacuum the loose debris from the gaps with a shop vacuum. Repeat scraping and vacuuming until the gaps are clear. Select a size (diameter) of rope that is slightly larger than the gap. Pour wood stain into a small bucket or cleaned plastic food container. Dunk the rope into the stain so it is saturated. Carefully pull out the rope, letting the excess stain drip back into the bucket. Lay out the stained rope on clean cardboard and let it dry completely. Do not expose the rope to direct sunlight or intense heat, as this could lead to a fire. String out the rope along the gap, then force it into the gap with a 5-in-1 tool or a putty knife, stopping when the rope is flush with (or slightly below, if desired) the wood surface. Filling gaps with wood putty is a quick and easy method that works on small, relatively stable gaps. However, there's a good chance the gaps will open up again during the dry season, and they may crack inconsistently. Clean the floorboards on both sides of the gap. Apply a fine bead of wood putty to the gap, then work it into the gap with your finger, using circular motions to force the putty down into the gap. Remove excess putty from the wood surface using a putty knife. Be careful not to scratch the floor's finish. Let the putty set up, then wipe gently along the filled gap with a slightly dampened cloth to remove putty residue from the wood next to the gap. Wipe parallel to the gap, making as few passes as possible to prevent pulling putty out of the gap. Let the putty dry completely before using the floor.